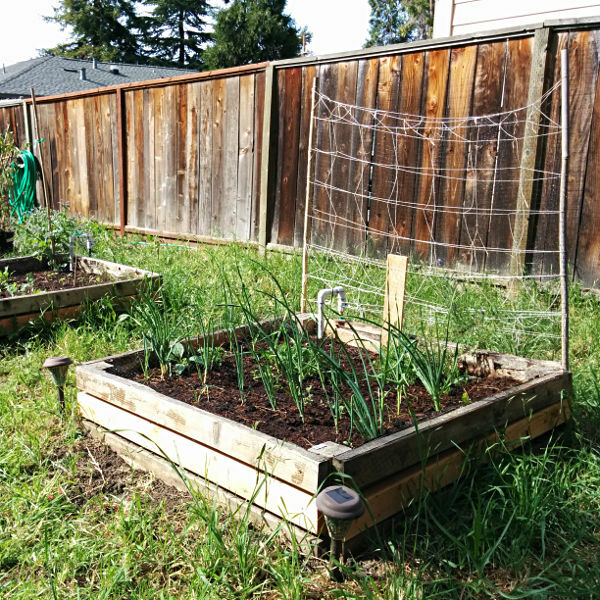 We're fortunate enough to live in a house with a relatively large backyard, but the soil is dry and cracked and full of weeds, so we decided to build some raised planter boxes. You can buy what appears to be a totally reasonable kit for around $40, or you can do like we did and build 'em yourself from 2x4s (we also used some thin plywood, but it was more expensive than 2x4s and it pretty much disintegrated after a season anyway, so we ended up adding more 2x4s). 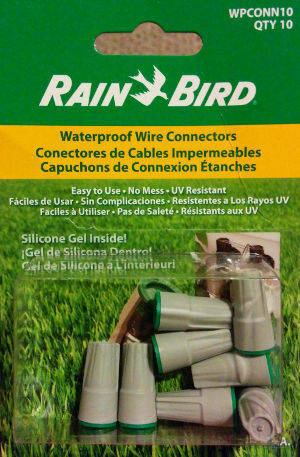 Last season we used those cheap spinny sprinklers but felt like we were mostly watering the area around the boxes. 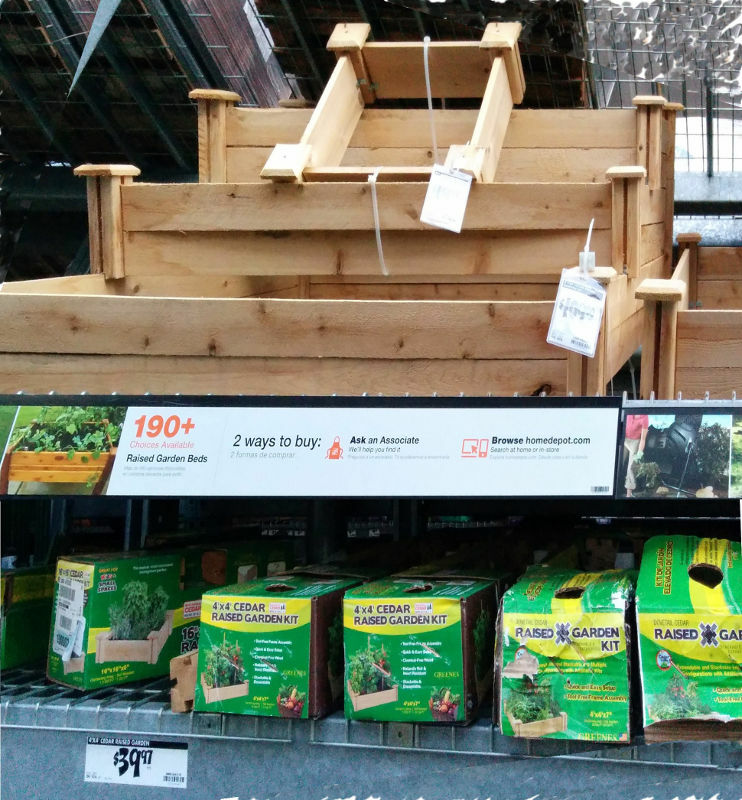 Additionally, we thought too much water was getting on the leaves and contributing to rot and fungus growth. 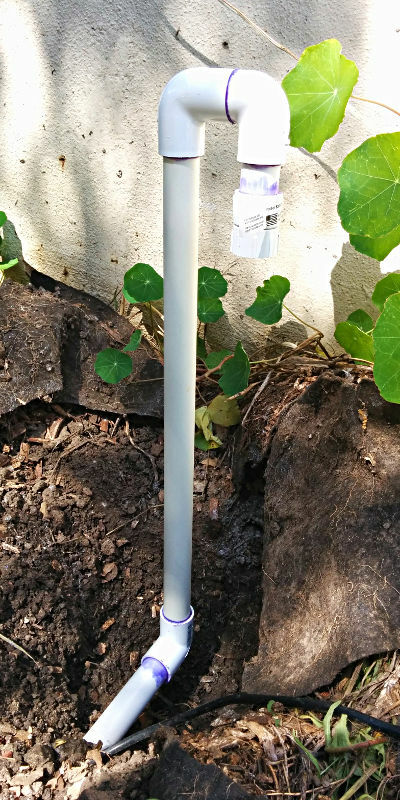 So, this year we decided to water underneath the surface of the soil. 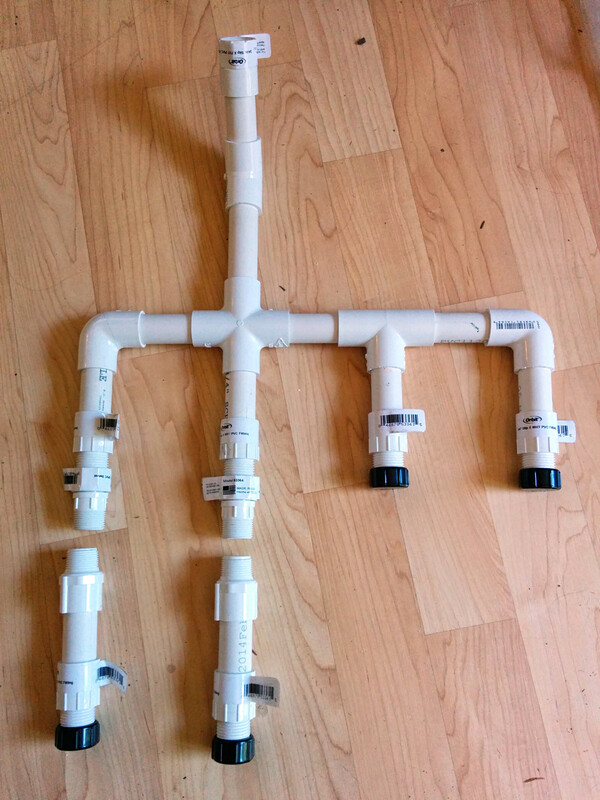 We built our manifolds out of 1/2" PVC with small (3/16"?) holes drilled along the sides of the "fingers". 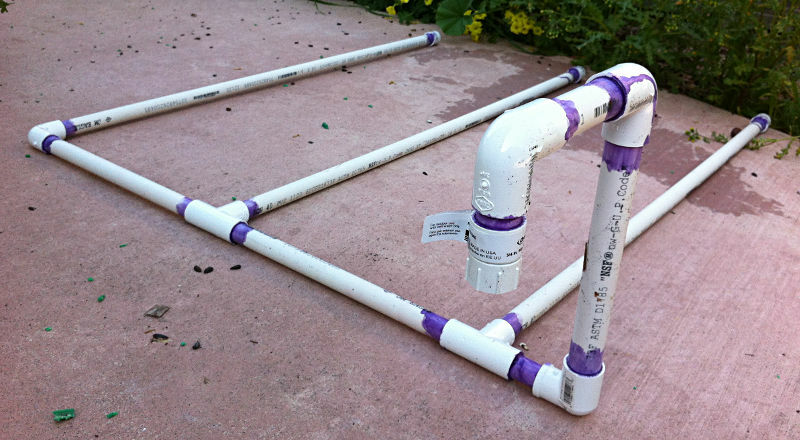 The vertical pipe and the "U" are 3/4" PVC ending in a female garden-hose-thread fitting. 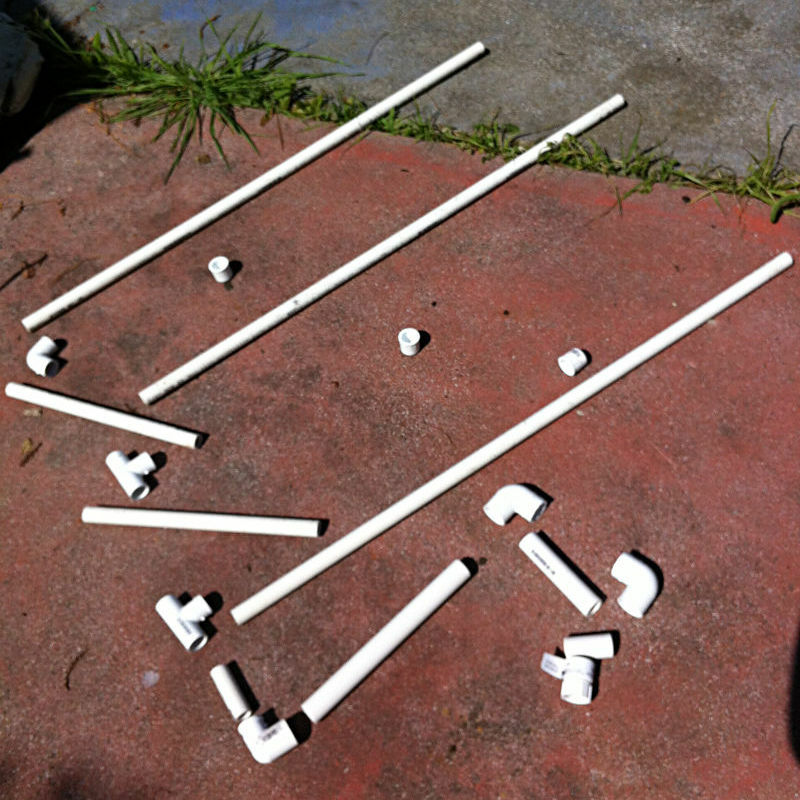 PVC is cheap and easy to cut with a hacksaw. 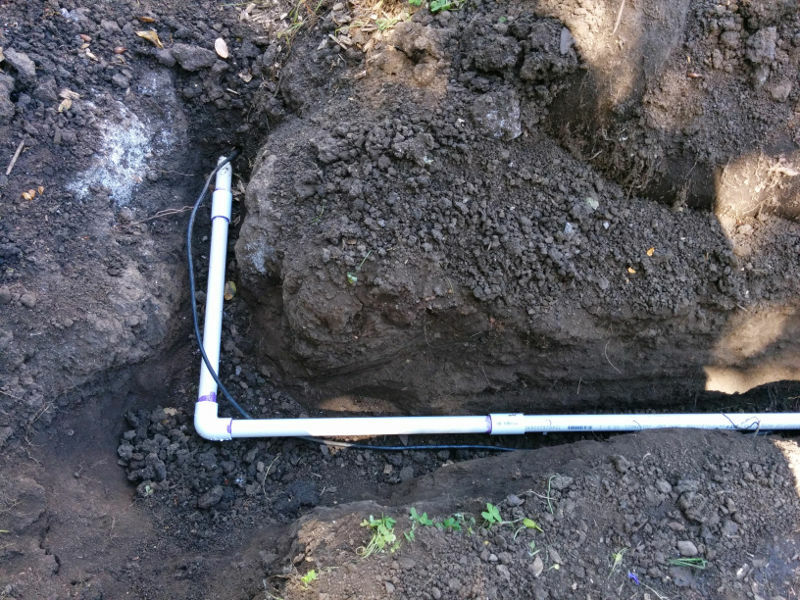 I strongly recommend glueing everything together with proper PVC "purple primer" and cement. Wear gloves. 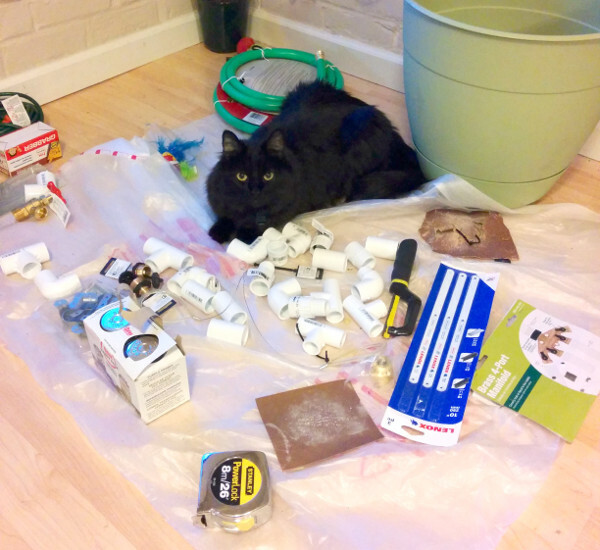 I think the cat thought he was a dragon hoarding treasure. The faucet is on the far left, by the outlet. 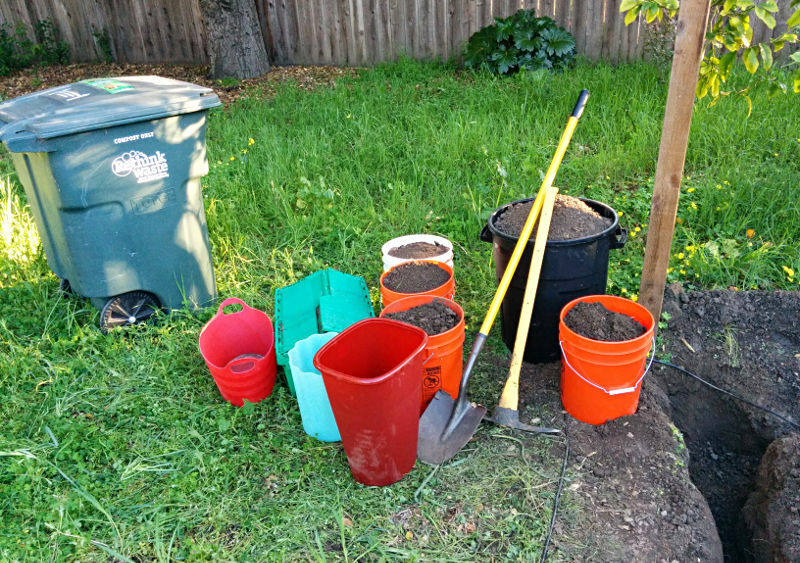 The next problem was that the best location for the planter boxes (for sunlight and maintaining use of the yard) was rather far from the hose bibb. 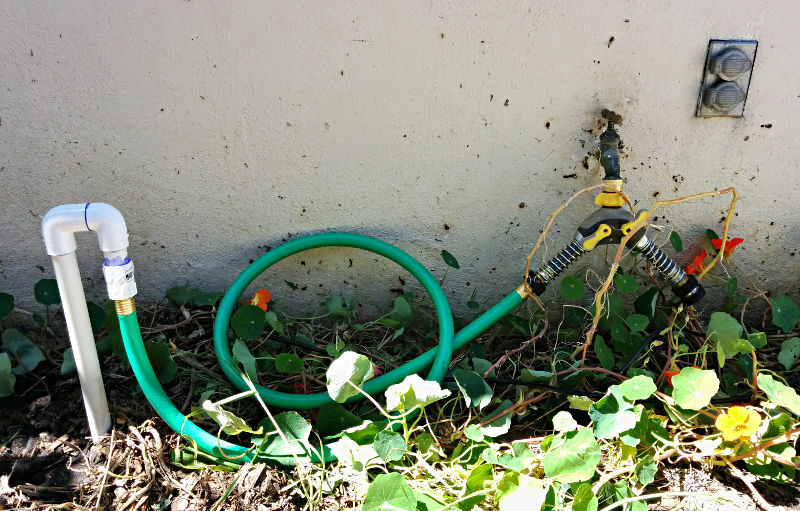 This meant having garden hoses strewn across the yard all the time, or constantly removing and re-placing them. 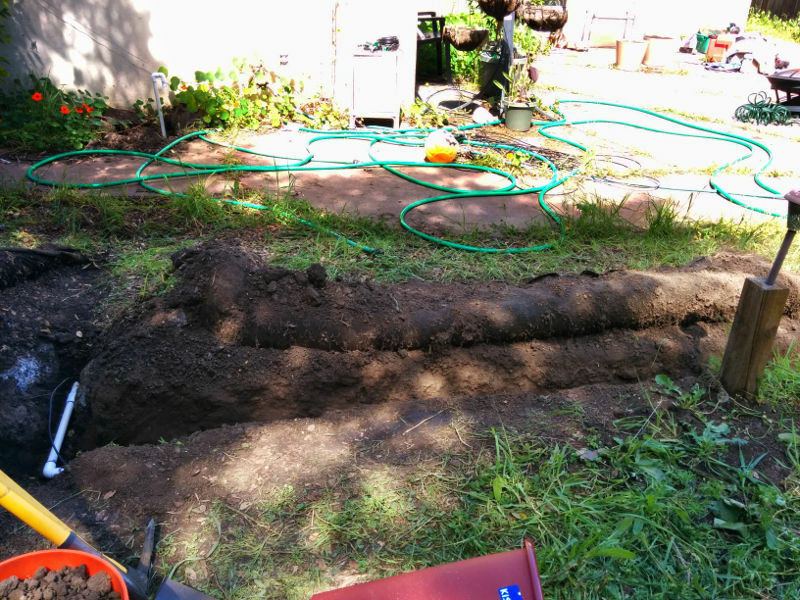 We dug an 9"-deep trench from a fencepost near the beds alongside the patio to a spot across the walkway from the faucet. The big toter is half full. 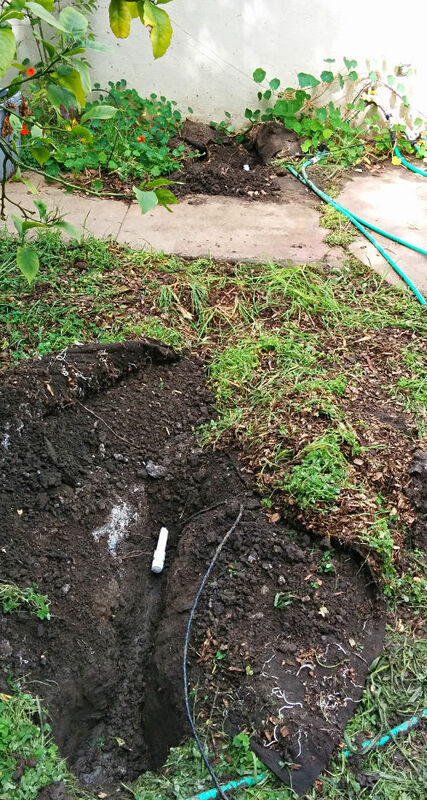 To cross under the walkway, we tunneled using a water-borer made from a garden hose attached to a 4' length of 1/2" PVC with an end-cap that had a small (3/16"?) hole drilled in the end. 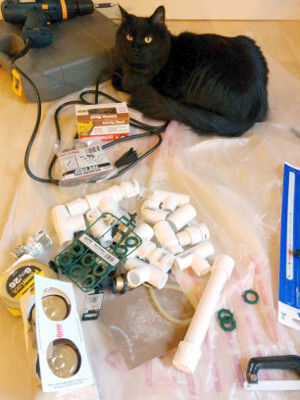 You can buy a kit for a few bucks, though it mostly only saves you from doing the drilling part. 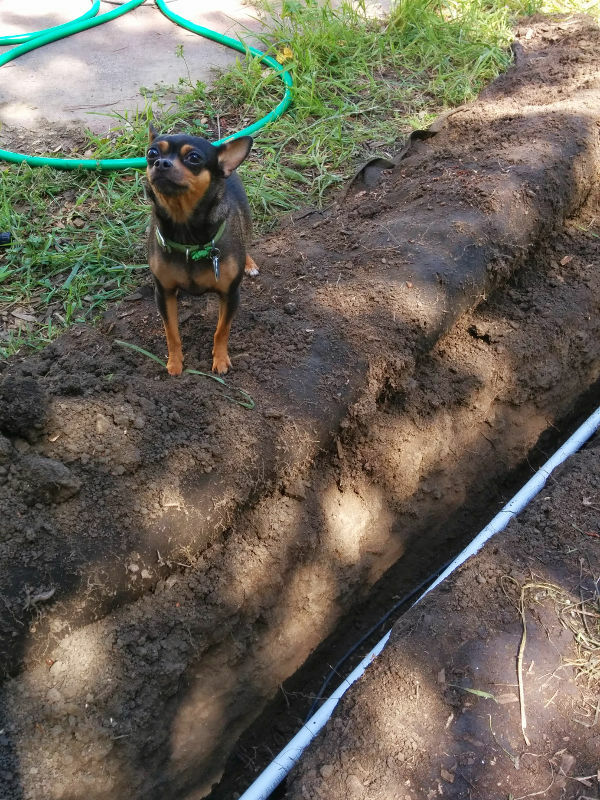 We laid down 3/4" PVC and the sprinkler wire in the trench and glued it all together. 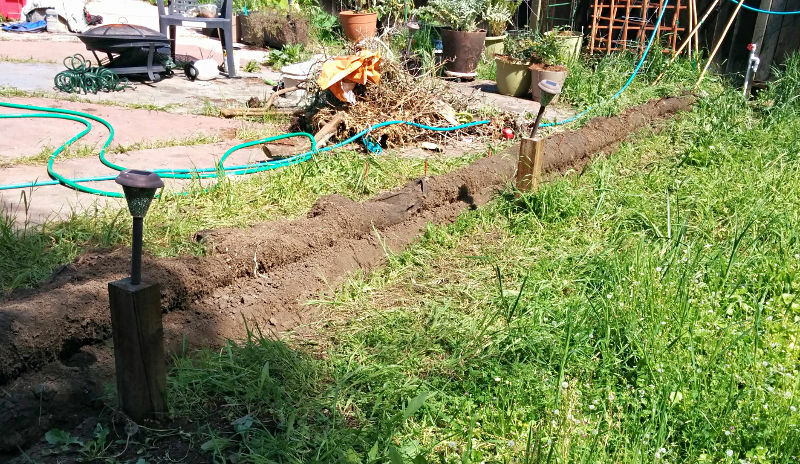 Something interesting we discovered in the digging was that there was landscaping cloth underneath the weeds. Peeling it back to dig was a bit surreal; I felt like I was in The Truman Show and my reality wasn't quite what I had come to expect. 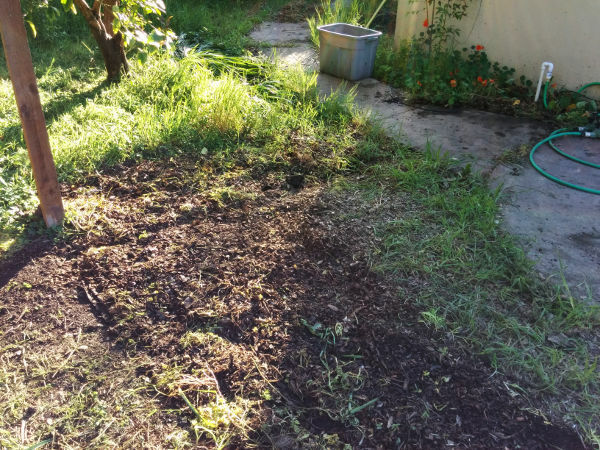 Finally, we put all the dirt back, packed it down (by stomping and wetting it a bit) and unrolled the grass. The exciting part for me is how it's all plumbed together. 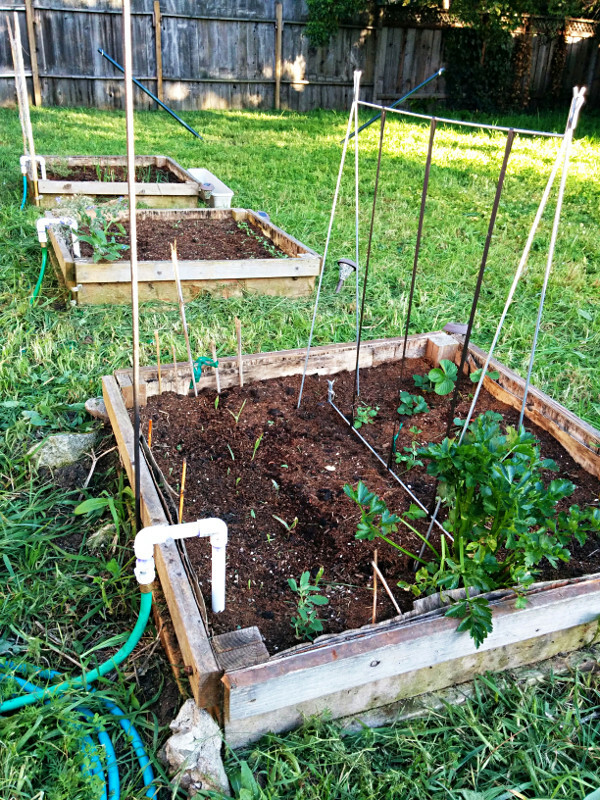 At the far end, we have both a faucet and an always-on garden-hose-thread fitting on the side, all securely strapped to the fencepost. 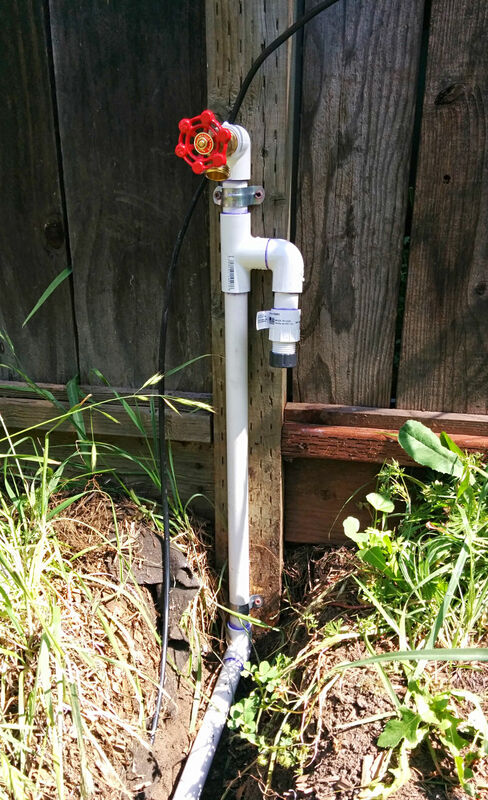 To the faucet, we connected a hose and mounted a hose-hanger above it on the fencepost. 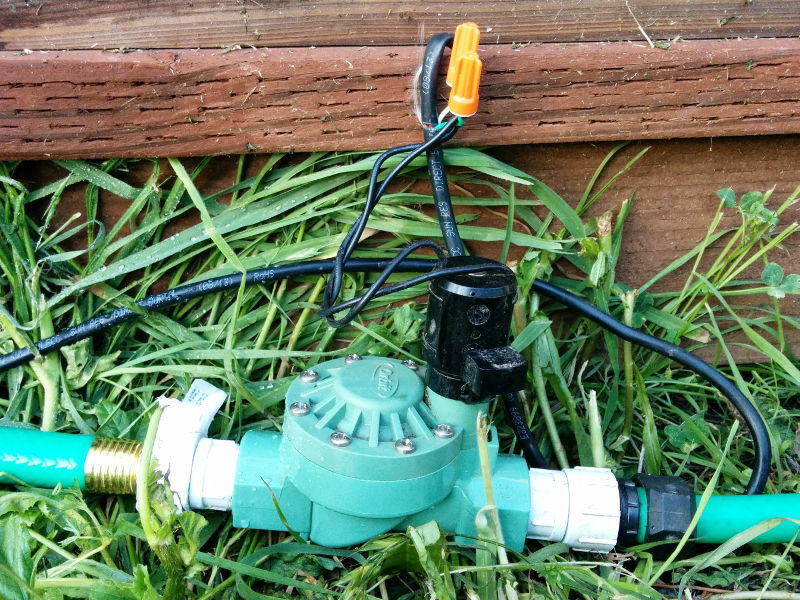 The always-on fitting connects via a length of hose to a standard 24VAC sprinkler valve. 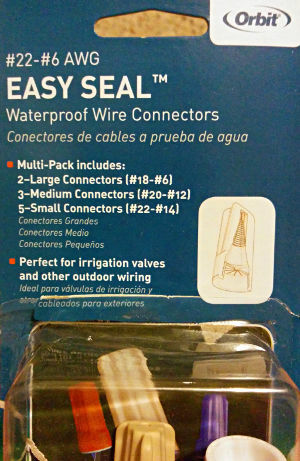 The valve is connected to the wire with waterproof wire nuts (filled with insulating goo). 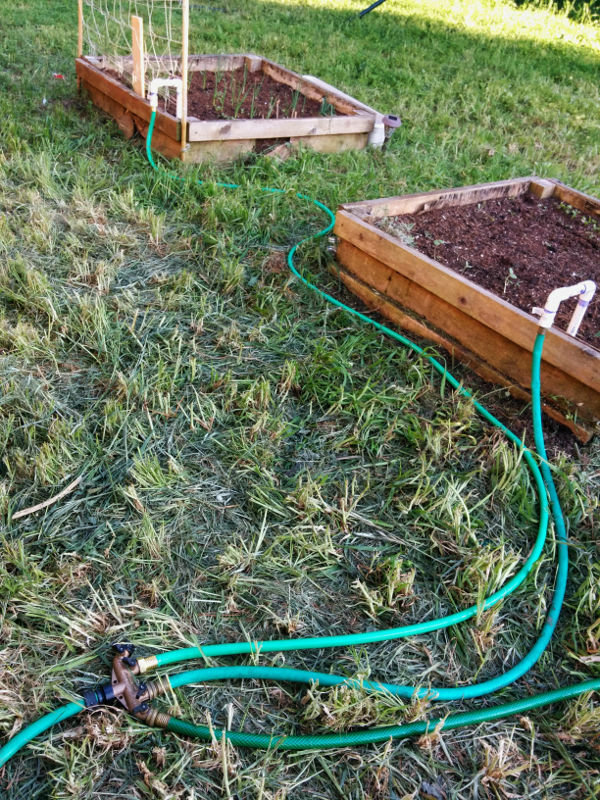 The valve feeds the beds via a 4-way splitter connected to more garden hoses of various lengths. 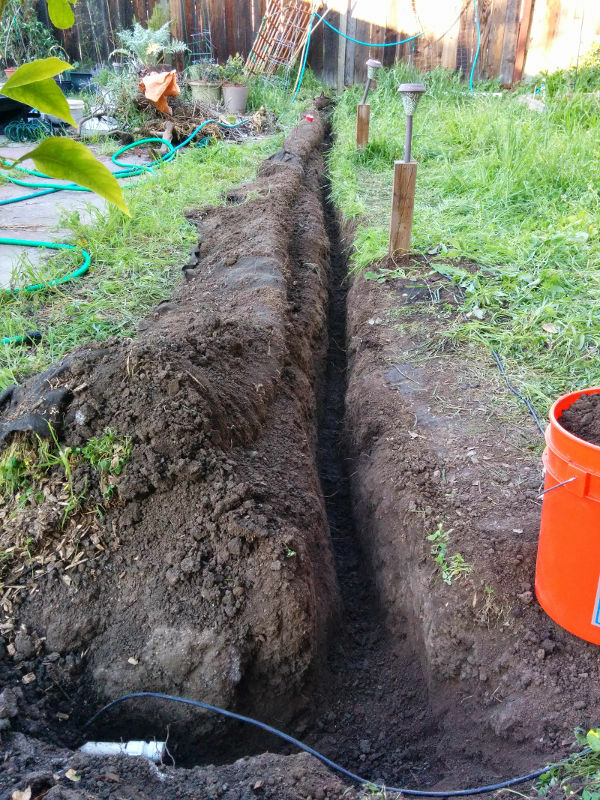 And behold, raised planter beds with underground irrigation without ugly hoses criss-crossing the yard. Huzzah!